Assorted Flavour Freezepops with Sugar and Sweetener. Full of flavour and lots of fun! 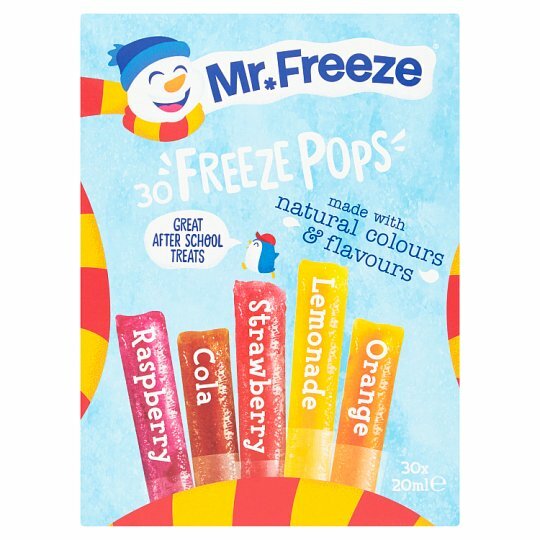 Our Mr Freeze freezepops have been loved by children of all ages for generations. Made with good stuff like natural colours and flavours, means they're perfect for hungry little penguins after school as part of a varied and balanced diet. Items in the pack must not be sold separately. Store in a cool place away from direct sunlight., Best Before End: see top or base of pack.